--A snowboarder was found dead in a tree-well at the Northstar resort last week. To read more, click here. --Rock and Ice is reporting that there was a large rockfall incident in Yosemite over the weekend on El Cap in the vicinity of Dark Star and The Prophet. To read more, click here. --The Onion posted an article entitled, "Woman’s Solo Hiking Trip Shockingly Doesn’t Have To Do With Inner Journey Or Anything." It starts with these lines, "Confusing her friends and colleagues as to what could possibly drive her to undertake such an expedition, sources confirmed Friday that aspiring explorer Jillian Greene’s solo hike through Yosemite National Park has evidently nothing to do with soul-searching, an inner journey, or any other form of self-discovery." To read more of this satire, click here. --Outside is reporting that, "Grand Canyon National Park superintendent Christine Lehnertz notified park employees on March 14 that she was resigning, effective March 31. This comes weeks after a four-month investigation turned up no wrongdoing and found a series of 2018 allegations against her to be 'unfounded.'" To read more, click here. --Graffiti in Red Rock Canyon National Conservation Area is getting out of hand. Volunteers spend thousands of hours and thousands of dollars cleaning it up. So now, there's a reward for those who see people tagging the rocks. 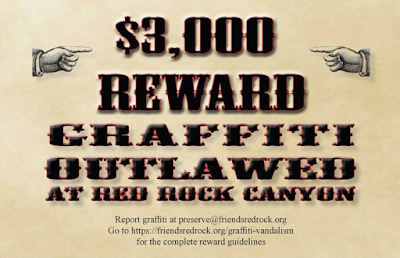 You can report graffiti at preserve@friendsfriendsredrock.org of find out more, here. --Outside is reporting that, "the recent additions to the Epic Pass highlight, again, the massive consolidation occurring across the ski industry, which is driving up rents and turning mountain towns into company towns." To read more, click here. --The Outdoor Alliance is reporting that, "on February 28, the State of Utah submitted its petition to the U.S. Forest Service requesting that the Forest Service implement a rulemaking to drastically roll back protections for National Forests under the 2001 Roadless Rule. The Roadless Rule has been important for protecting outdoor recreation. While roadless areas are protected from new development, their management is less restrictive than in Wilderness, which gives important middle ground for many kinds of recreation, from mountain biking to motorized use." To read more, click here. --As the team that attempted K2 in the winter returned to basecamp, Himalayan writer Alan Arnette asks whether it's even possible to summit K2 in the winter. To read the article, click here. --Elizabeth Swaney was the American woman who competed for Hungry in the half-pipe competition at the last Olympics. She was roundly criticized for completing her run without doing any tricks. Unlike Olympians who have been hailed for their persistence even though they did poorly, Elizabeth was attacked. But her "back-way in" to the Olympics isn't the whole story. To read more, click here. --And finally, rock gyms are a little bit of an afterthought on this blog. But that doesn't mean that they aren't an important part of a climber's training. And an important part of the gym experience is route-setting. Setters build routes for different body types. So it's a problem when the bulk of the setters come from one gender. Gripped asks, where are all the female route-setters...? To read the article, click here.